Ecuador, located in South America, has a population of 13 million inhabitants. Although an oil exporter, it is still one of the poorest countries in the region. This is mainly because of inequity in the country's distribution of resources. Twenty six percent of all children under five years of age nationwide have stunted growth; in rural areas, the figure is 31 percent, and in indigenous communities it reaches 47 percent. It is reported that approximately 61 percent of the population lives in poverty. Anconcito is a small town in the Province of Santa Elena, two hours west of Guayaquil on the outermost peninsula of the country. Recent emigration of fishermen from other coastal regions of Ecuador has created a major strain on Anconcito’s already limited infrastructure. A young man stands in his kitchen in Anconcito, Ecuador. 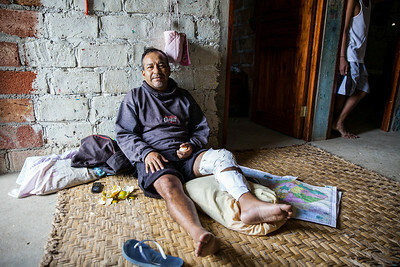 A man sits on the floor in his home after a motorcycle accident. A young girl sits in the family kitchen completing a health census form as her mother and sister gaze out the window. A young girl whispers a secret to her mother. 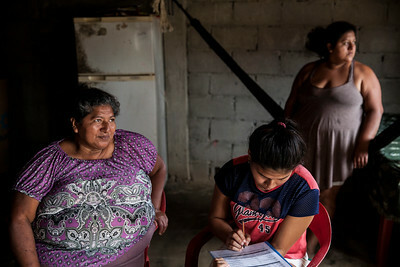 A woman watches as her husband (unseen) answers health related questions during a census carried out by FIMRC in Anconcito, Ecuador. A woman offers up some fried plantains in her kitchen. A teenage mother breastfeeds her seven day old infant as Dr. Melba and her assistant look on. Dr. Melba consults with a woman during a house call for high risk pregnancies. Dr. Melba examines a young pregnant woman who is bed-ridden. A young mother speaks with a health census volunteer. Her young child is 14 months old but weighs less than 15 pounds due to a intestinal infection. 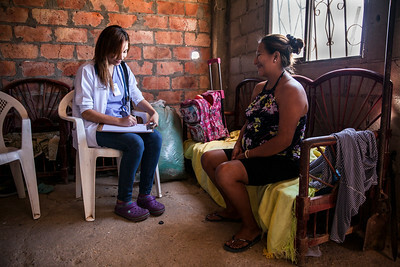 A man in Anconcito uses daylight from the window to read instructions from the clinic physician. 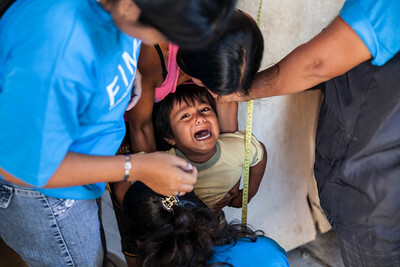 A young child cries as he is weighed and his height is measured. Malnutrition among the population of Anconcito is at epidemic proportions.